We believe so strongly in the power of brand that our founder Rachel Downey created another consultancy, PlaceHolder, built on the belief that purpose and brand should always come first when you are thinking about, planning or actively doing place-based design. This may seem obvious, particularly with the rise in popularity of Simon Sinek’s book Start With Why and his TED Talk on the same subject. However, when it comes to civic brands, this concept is at the heart of successful brands. In this paper, we share our perspective on what exactly a civic brand is, how it differs from the traditional views and uses of brand, and its function and purpose for your place. I think it’s fair to say that most people have a general understanding of brand. Our relationships with brand stem from what we will initially identify as corporate branding. This is closely associated with the marketing of branded products or branded services under a branded company name. Most people associate with the visual representation of corporate brands — the logos — and perhaps may feel that this, in essence, is the embodiment of brand. As a result, often when a new client contacts us and says, “We need a new brand,” their expectation is the development of a logo. This is an important component of any brand, but when you are talking about civic branding, you may be missing an enormous treasure trove of value if the visual mark is the only thing you seek. In fact, the logo is simply the visual embodiment of something much larger – a feeling, sentiment, values, a set of experiences – that your brand stands for. When we begin to identify what the differences are between corporate or product brands and civic brands, a few topics become apparent: What is their structure? How do they function? How do they interface with other brands? Who owns them? The structure of corporate brands is planned and, to a certain degree, controlled. A company forms, they choose a name, they conceive of their mission, they develop a few products and then they build a brand that can market their product or services to their selected audiences. Granted, it’s no simple process and companies engage in massive market research to steer their decisions. But still, the message and purpose is specific, targeted and controlled. For that reason, we have identified this method as controlled branding. Just like the companies they embody, the structure of this type of brand has a top-down approach, carefully controlling and managing the various sub-brands, products and messages under their roof. It’s conceived and developed in-house and then fed to their audiences. When we talk about civic branding, you may not have the same amount of control that you would have with a corporate brand. It is a collection of perceptions, whether planned or incidental that are inherent to your city, town or district. You’re not inventing a new place; you are working with what you have. You don’t get to choose your audience – it’s already established by residents, business owners and visitors. Their past experiences with your place influence the existing brand. While you may take measures to manage your brand, is it somewhat organic and cultivated by those who interact with it. We say cultivated, not controlled, because public- place brands are difficult, if not impossible, to control. They are not controlled by a singular over-arching entity; civic brands are subject to the dynamics of a moving city comprised of thousands of assets and people. But if well cultivated, a solid civic brand can relinquish control and become loved, leveraged and owned by the people who are invested in that community. In contrast to a controlled brand, we call this a foundational brand. has a different job. It can define your boundaries, influence the perceptions, achieve the aspirations and connect to the experiences your place has to offer. It’s a tough job. Few cities start a branding process with a perfect set of circumstances. You may not be completely pleased with the area you are defining – maybe it’s aging or in need of repair, it may lack resources or be unattractive. In fact, while many of the challenges of a place may be out of your control, brand is a tool that is often leveraged to remind people why we still form attachment and appreciate these places. The perceptions that have been built are created from years of existence, stories from the past, and experiences; these places have an identity, carry perceptions and purpose all their own that can’t be fully controlled. Authenticity: uncovering and elevating shared ideals, beliefs, and experiences that already exist. It’s about finding your purpose: the reason why people choose to live in, do business with or visit your city versus other places. Connection: recognizing the value of the community stakeholders and creating a platform to nurture shared commonalities and experiences. This is about finding the thread that strings your best assets together. Extension: with foundational brands, stakeholders can (and need to) retain their own brands and identities. The presence of a strong foundational brand can enhance their ability to market and attract patrons/visitors/talent, etc. sense of community and purpose. This creates an environment of collaboration, economic investment attraction and achievement of aspirational goals to be the city you know you can be. Yes, well-planned, strategic civic brands can do that! North Coast Harbor district in Cleveland, Ohio is the perfect example of how a foundational brand can stand on authenticity, identify a shared belief and create connections with the existing stakeholders for the purpose of activating a place. Before the foundational brand was established, North Coast Harbor started out with significant assets, including the Rock and Roll Hall of Fame, the Browns Stadium and the Great Lakes Science Center, not to mention Lake Erie! It’s the only public lakefront area downtown — but people rarely used it. When people visited, they came for one place/one experience and then left. By discovering a purpose that didn’t control or overpower the existing brands that lived in the district, these entities have begun to provide and support a variety of shared experiences — from concerts and happy hours to new programming such as Lake Front Leagues and North Coast Namaste, a weekly free yoga event. These new activities encourage people to extend their experience — enjoying all this distinct area has to offer. Read the case study on North Coast Harbor. their own specific, targeted and controlled brand; their own purpose and their own promise. In contrast, a foundational brand doesn’t want to be “all about me;” it wants to be all about “us:” see what “we” have, what “we” offer, what “we” provide. Collectively, you create a place that is healthy, well maintained and cares about what its stakeholders need to succeed. It provides a locality, a place to call home. So what does this mean for the stakeholders? 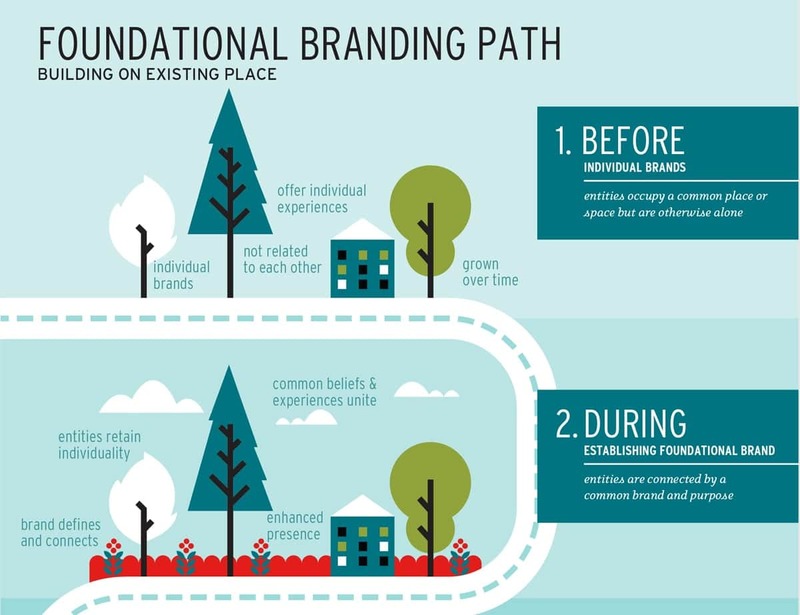 When and how do they adopt the promise of the foundational brand? How can this be done and what does that look like? And if this is all about “us” who truly owns the foundational brand? For a place, brand is about the promise of a great experience. If you are a civic place, that promise is a big deal and it comes with added challenges: you don’t own or manage the restaurant on the corner, or the public parking garage, or the residents that are buying up the condos in your buildings. How do you get these owners and managers — your stakeholders — to believe in the promise you are making about your place? Purpose is the root of why an organization or a place exists. It drives those responsible for a place to dig deep for answers to questions like: Why do we exist? What unique value do we bring to the world? What do we believe so deeply that we will do our best to fulfill that belief? Place-organizations/governments, such as cities, Community Development Corporations (CDCs), Downtown Associations, Main Street Organizations, etc., can’t create this type of emotional, high-powered statement in a bubble. Civic brand purpose must be uncovered, co-created, revealed and championed by the people who make up your place. The stakeholders must be involved in the development of the foundational brand. Whether they participate as part of a Steering Committee or they are just part of stakeholder engagement, they have a responsibility to work together with the organization and other stakeholders to participate, review and ultimately recommend a shared Purpose – one that they are comfortable with as both an individual brand and as an “us” because, ultimately, they share in the ownership of the brand. Having a shared Purpose begins to build your foundation and connection to each other. A clearly articulated Purpose provides a clear framework for making decisions that determine overall strategies, design, communications and experiences, which will engage target audiences. When an organization and its stakeholders face a challenging decision, they can look to their Purpose Statement for guidance. There are many ways that stakeholders can help to fulfill the Purpose and promise of a place without losing their own identity. First and foremost, they can simply refer to the place as home. For example, the Constantino’s Market has two locations in Cleveland, Ohio. More specifically, one calls the Warehouse District home while the other resides in University Circle. Civic brands can provide specificity to locations. If all stakeholders begin to establish the foundational brand as their home, recognition begins to be established for a place that supports a variety of amenities and experiences for people to enjoy. We’ve seen Main Street and Downtown organizations provide the logo or seal on windows and doors to show that the business takes pride in being a part of the neighborhood, downtown or district. Stakeholders can also include the name of the foundational brand in their communications materials and on their website. Logos, the graphic identities of civic brands, should be designed with the understanding that their identities might have to visually play nicely with the brand identities of other stakeholders. Other communications devices, such as maps, brochures, etc. developed by the larger place organization, should be used by all businesses and stakeholders to consistently communicate their own location as well as their neighbors. Events and programming meant to bring people to the place should be supported, and even sponsored by the local stakeholders. The sole purpose of a civic or foundational brand is to support the health and success of a place. That means the success of the people and stakeholders that make up a place. Civic brands have a responsibility to connect the “unaware” to their businesses, amenities and activities. Communications and marketing tell the story of the shared promise and Purpose as well as providing a platform for recognizing the stakeholders that call their place home. A civic brand website will identify and link back to the stakeholder websites. Advertising for events and promotions by stakeholders is also supported and pushed by the civic brand. When considering new events and programming, place organizations often focus on connecting these events to the stakeholders that reside there, opening up opportunities for more interaction. North Coast Harbor in Cleveland, Ohio created signature events such as Fish Free in CLE and IceFest to bring awareness to old and new stakeholders and more activity during the district’s slower months. It wouldn’t be wrong to say that a civic brand is owned by the place and its stakeholders. But, most civic brands have a singular organization responsible for orchestrating the development of the brand (usually the city, a CDC or a non-profit). It must be managed by those stewards. They should also be responsible for maintaining the clarity and integrity of the brand, or should clearly identify who is the owner. The messages and images associated with the brand should be managed and distributed by a single entity. We always recommend developing a brand standards manual because it is critical to have this tool in place to guide the usage of a civic brand by the organization and its stakeholders. A poorly managed, or ignored, brand can result in millions of dollars in lost income, investment and opportunities. Civic brands aren’t meant to detract from the individual businesses, amenities and activities that make up the experience of a place. The fact that civic brands are developed from collaboration and buy-in from stakeholders should encourage and build confidence that a foundational place brand can create exceptional interactions and connections with the people who live, work and visit your place. The purpose of brand is connecting with people. Brands work hard to package up a lot of information and promises, making it easier for people to identify and gage interest in engaging with your place. Creating a logo that uses a physical attribute such as an iconic building to represent your city can no longer cut it as a brand. A foundational brand is your competitive edge in attracting economic development, talent, residents and visitors. A poorly managed brand (or one that’s ignored) can result in millions of dollars in lost income, investment and opportunities. On the flip side, if a civic brand is authentically created with the purpose of defining, influencing and connecting people to your place, the return is economic vitality — enhanced quality of life, engaged people, and ultimately financial growth and stability, for you and your stakeholders. Shared support = shared success.